Tommy Chong's Chong Glass factory, as well as his home were raided by federal drug agents and other officials today. It was part of a nationwide DEA plan to close companies that manufacture and sell drug paraphernalia. It's unknown if charges have been filed against Chong or Chong Glass. "Those under indictment face a maximum three years in prison, and/or a $250,000 fine, per count, if convicted." The bust was organized by John Ashcroft and the Bush administration. Ironically, President Bush was a major drug user in his youth. It's unknown if he and his wife, Shelby, will still be performing their stand-up act tonight and tomorrow at Laff's in Tucson, AZ. 02.25.2003 Update: This is an update to the story we ran yesterday. 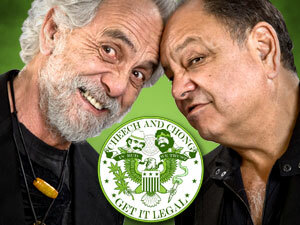 To the best of our knowledge, no Chong and Shelby stand-up gigs were cancelled. In addition, Chong Glass is owned by Tommy's son, Paris Chong. Neither Tommy, nor Paris were arrested. Other headshop owners weren't so lucky.